Stores enable sellers and vendors to showcase their brand story and product portfolio in a curated customer destination. Now, Store owners also have access to a new dashboard with a full range of metrics to better analyze overall Store performance. 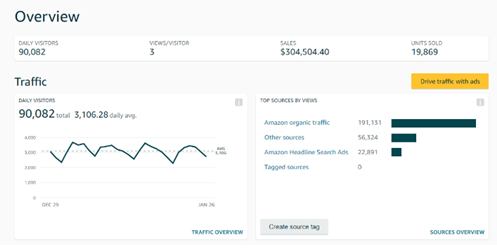 If you’re a Store owner, you can access the new dashboard within the Insights tab of the Amazon Stores interface (vendors | sellers) to analyze daily visits, page views, page views per visitor, sales, and sales units. Data is displayed by page and traffic source, providing unique visibility into how to optimize your marketing strategy and identify new opportunities to drive Store traffic. Store owners can see which sources are generating the most Store page views and sales – including organic Amazon traffic, Sponsored Brands (formerly Headline Search Ads), or external such as social media channels. You can also create a source tag for your Store URL and use it to measure traffic from specific external sources. Data is refreshed daily and is available the next day for views and daily visits, and after 2 days for attributed units and sales. For example, if it’s Wednesday, you can see views and daily visits from Tuesday or earlier, and attributed units and sales from Monday or earlier. You can toggle your dashboard view between Overview, Traffic, Sales, Pages, and Sources to analyze metrics in a graph format. Data is available by day or over a selected time period, and can be exported in a CSV file. Sign in to your account, then visit the Insights tab of the Stores interface (vendors | sellers) to get started with your dashboard, or sign in to create your Store today.